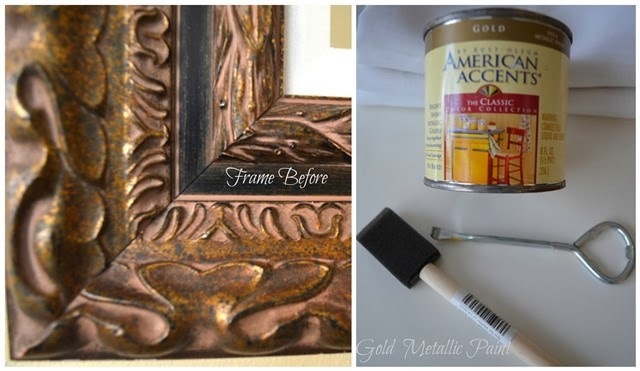 My frugality takes me to an upcycling level that many times even surprises me. When I express some of my ideas about rehabbing pieces to my hubby, I get a blank look as he can't envision what I can see in my mind's eye - everything can get another lease on life and doesn't have to end up in a landfill or be completely wasted. Most of the time he thinks I am totally bonkers for taking on time consuming projects, but when the project is completed he appreciates the end result. These frames for instance, are the perfect example of that. They've been in our possession and have served us well in each decor style we've had, but for the past two years I've grown weary of looking at them and wanted something different. 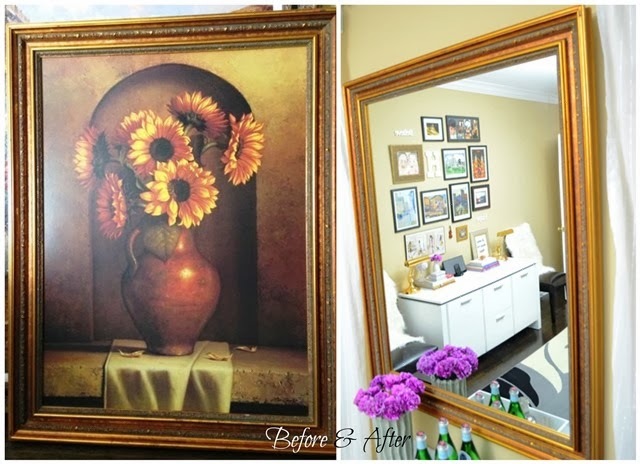 After a few failed attempts to sell them on craigslist, I had this light bulb moment when I needed to open up some space with mirrors and I thought, 'Ooh, just replace the prints with mirrors!' I simply brought the frames to a local glass company and had mirrors placed in them, which took only a couple of days and was reasonably priced. 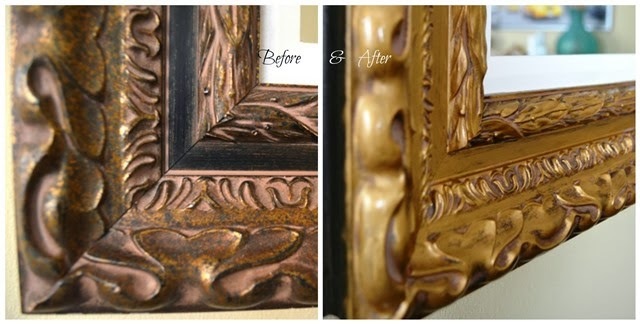 After picking them up, I decided to revive one of the frames with some gold metallic paint (my latest obsession). In decor, mirrors have been one of the most invaluable accessories that is used to create depth, reflect light, amplify space and/or to reflect a great view or artwork, but can be pretty expensive. 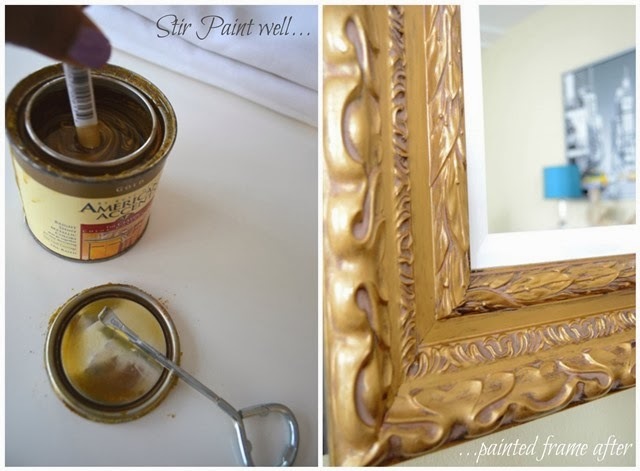 So if there's an opportunity to upcycle an old, yet perfectly fine frame - why not? The money that would be spent buying new mirrors can be used for other necessary decorating items for the home or in my case, some of the things on my wish list. 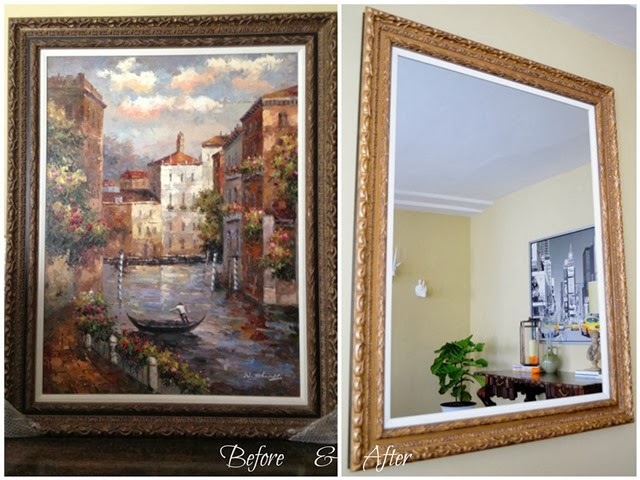 I really hope this inspires you to look at some old frames propped up in the garage, attic, or in a corner of your home with fresh eyes;).